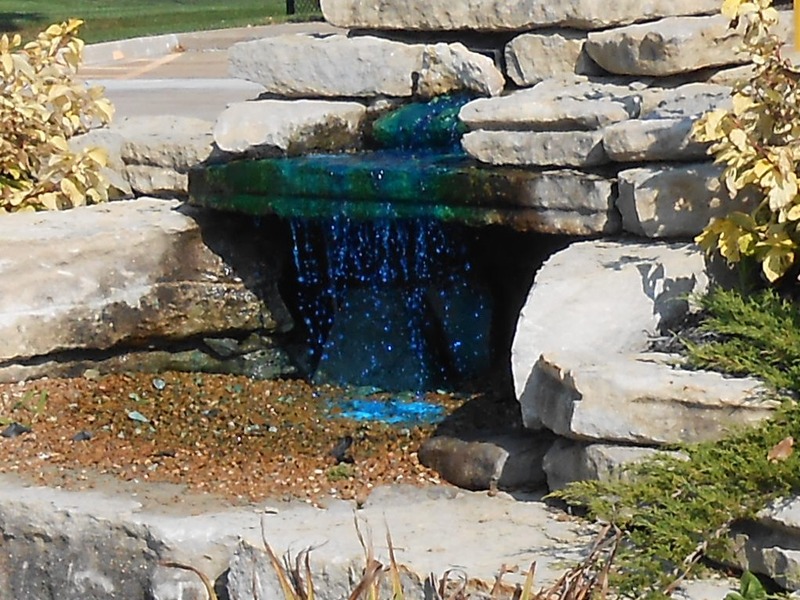 Alderman Pat Ertz submitted these photos of Water District #2 showing support for the Royals. Hopefully the water that is delivered to their customers is not blue. 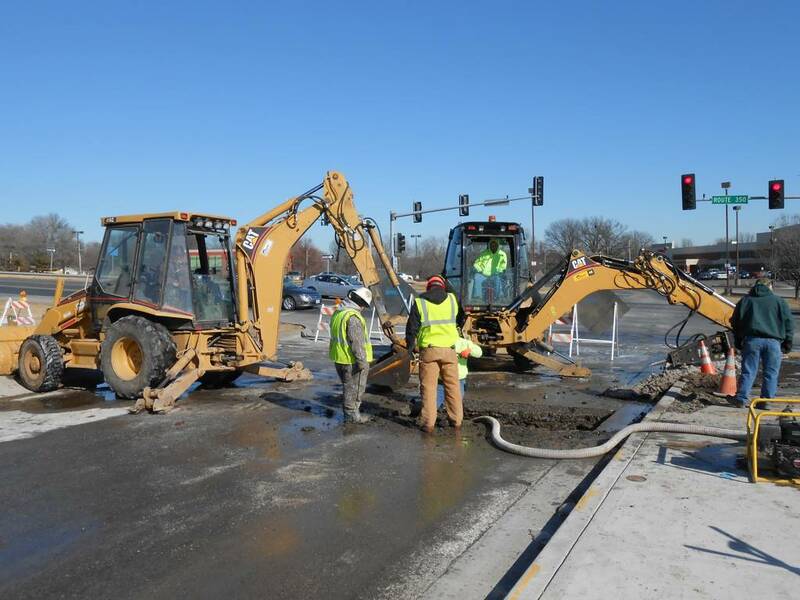 Pictured are two crews working on a busted water main near 350 Highway. 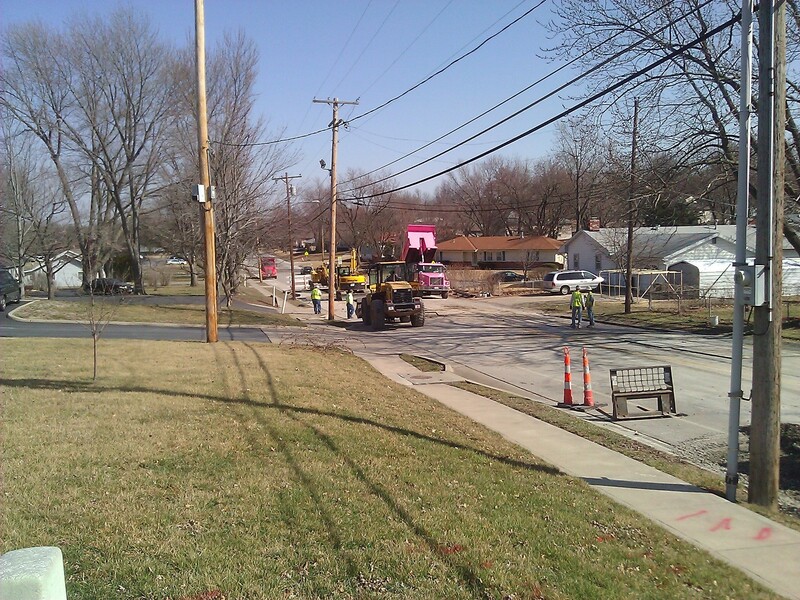 What is unusual is that the crews are from both water companies in Raytown working together to restore service. 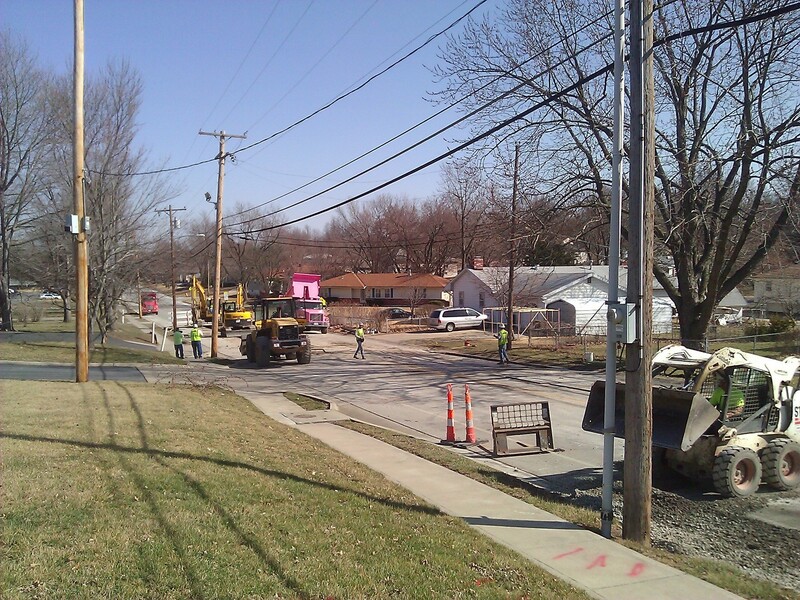 Water District #2 came out to help Raytown Water Company repair a frozen main break. Public Water Supply District No. 2 of Jackson County encourages customers to protect water pipes from breaking during freezing temperatures. Simple winterization steps can prevent pipes from freezing and bursting inside homes, which can lead to costly repairs. Leaving a pencil-lead-thin stream of water flowing during freezing weather. In the instance that a water pipe breaks and the shut-off valve doesn’t work, please call your Water Department immediately to request an emergency shut-off. Water Service crews are available 24 hours a day, seven days a week. Public Water Supply District No. 2 and the Raytown Police Department Sponsor Drug Take-Back Event -April 27, 2013! Public Water Supply District No. 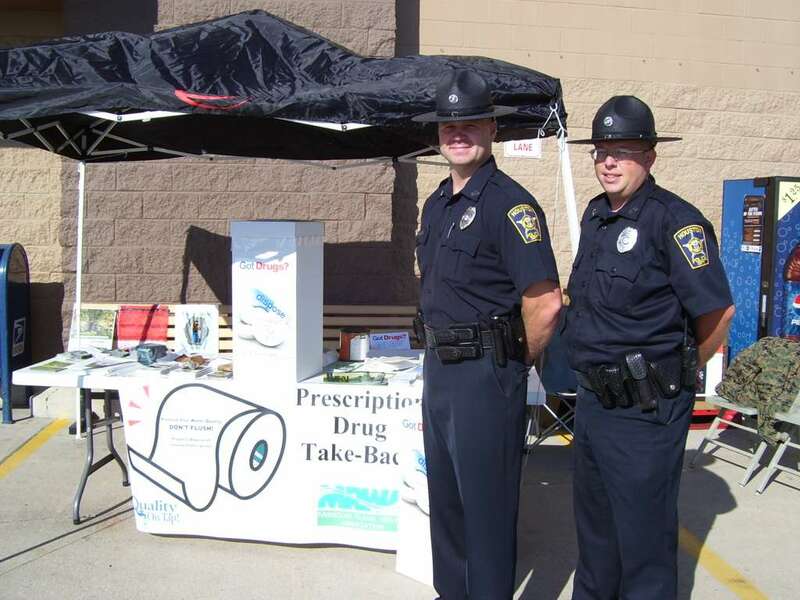 2 of Jackson County, Missouri & the Raytown Police Department is sponsoring a Prescription Drug Take-Back Event on April 27, 2013, at Apple Market on 75th & Raytown Road and the City Hall Parking Lot at 10000 E 59th Street. The public may drop off outdated prescription drugs from 10:00 AM to 2:00 PM. The Missouri Rural Water Association (MRWA) is working in conjunction with drinking water utilities around the State of Missouri in an attempt to lessen the environmental impact of these pharmaceuticals. National research indicates that 46 million Americans consume water contaminated with prescription and over-the-counter drugs. Missouri was one of 24 states where water samples from underground aquifers were tested and found to contain pharmaceuticals. Concern about the possible human health effects of these drugs is behind the counter-offensive launched by your local water utility and the MRWA. “The way to reverse the trend is to eliminate contaminating our drinking water sources by properly disposing of pharmaceutical drugs”, says MRWA Management Circuit Rider, Larry VanGilder. But who’s contaminating drinking water sources? You might be surprised to learn that you could be unintentionally fouling the waters! If you dispose of prescription drugs by throwing them into a trashcan or flushing them down the toilet, your actions could be having an adverse effect on the environment. Solid waste thrown into trash receptacles eventually makes its way into a landfill, where these pills and other medicines can leach into the ground. From there, they can contaminate underground aquifers, which provide drinking water for communities and individuals. With each flush, the toilet sends waste into either a private septic tank or a centralized wastewater collection system. The septic tank, like the landfill, potentially allows medications to contaminate ground water sources. The centralized wastewater system returns its treated water back to receiving streams and tributaries. These treatment facilities are unable, with today’s technology, to remove pharmaceuticals from water. The only way to properly dispose of unused drugs is to incinerate them. This is the task of the federal Drug Enforcement Agency. Collection sites, with the help of local law enforcement, deliver these waste products to the proper authorities for disposal. During the last event held September 29, 2012, 17,208 pounds of pharmaceutical drugs were collected in Missouri. All pharmaceutical drugs collected were taken to a DEA facility and incinerated. “Having these drug take back events on a regular basis each year provides the people of Missouri the opportunity to properly dispose of unwanted pharmaceuticals and greatly contribute to preserving the quality of water bodies we all enjoy and depend on for our basic needs and for recreation,” says Larry VanGilder, Management Circuit Rider for MRWA. Public Water Supply District No. 2, the Raytown Police Department and the MRWA encourage you to take part in the April 27th Prescription Drug Take-Back Event! Patrick Ertz at (816) 353-5550 or by email: pwsd2@pwsd2.org. 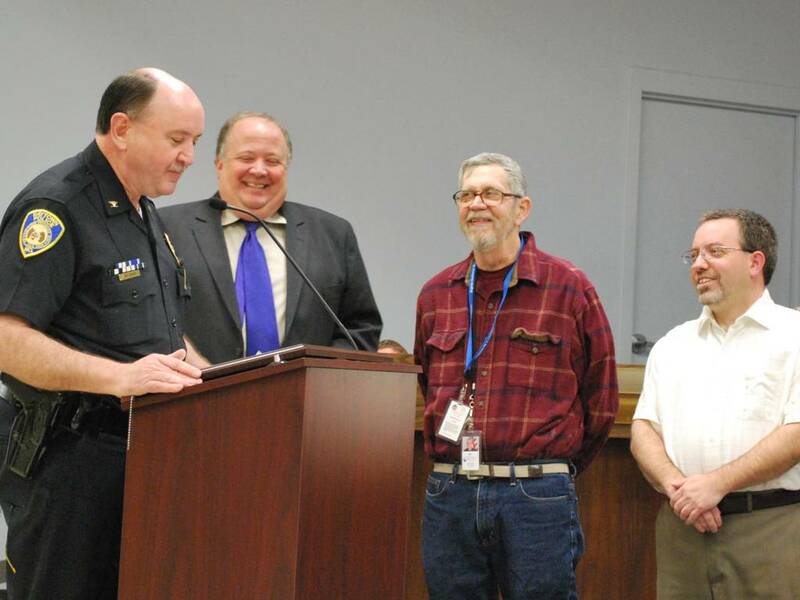 At the February 19th Board of Alderman meeting, Chief of Police Jim Lynch presented Public Water District #2 Manager, Pat Ertz, Board Member, Jim McClanahan, and Secretary of the Board, Richard Tush, with an award for the water district donating a drug take back box to the City of Raytown. The dug take back box is located in the lobby of the Raytown Police Department and is for the disposal of prescription and over the counter medication. 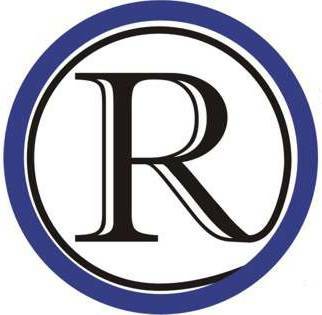 The City of Raytown will benefit from the reduction in both the risk of contaminating the water supply and from the illegal actives related to many prescription drug use that occurs when others raid medicine cabinets for forgotten prescription drugs. 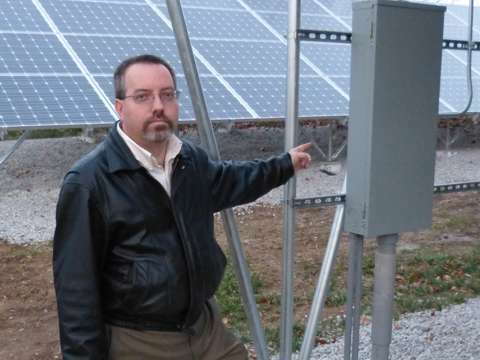 Jackson County Water District #2 has added solar arrays and added geothermal heating and cooling. They are also in the process of changing to more energy efficient lighting. 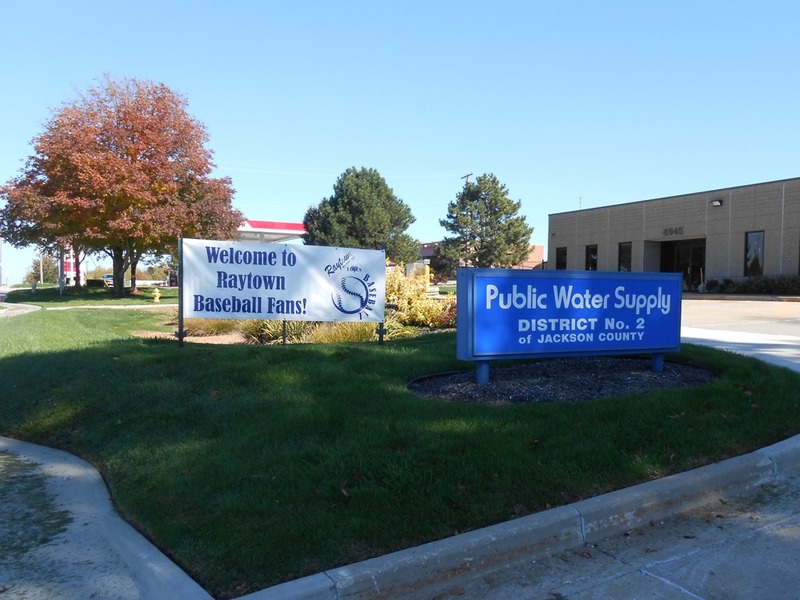 The $50,000 check from KCPL results in an immense shortening of the payback time frame and will help keep Raytown patron’s water bills from rising. According to Raytown Police, an estimated 270 pounds of drugs were taken back in Raytown. A great success! The July 24th boil advisory has been lifted at about 11:30 p.m. on July 25th. The Raytown Police Dept. issued a boil advisory at 10:27 p.m. Tusday July 24th for an area from I-70 on the North, 87th St. on the South, Blue Ridge Cut-off on the West and Raytown City limits on the East. Just in from the Directory of Jackson County Water District #2… The boil advisory warning for water in Raytown has been lifted. 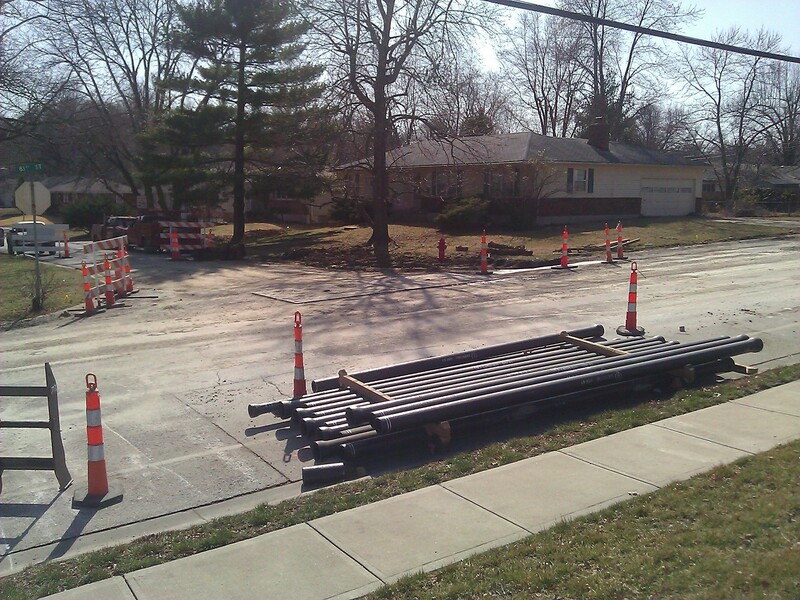 77th Terrace between Raytown Road and Arlington Avenue will receive new six inch in diameter, ductile iron pipe. Three new fire hydrants will be added to the current two, giving this neighborhood greater fire protection. This job will start after Memorial day and is expected to be completed in approximately 60 days. Sterling Avenue between 350 Highway and 83rd Street will receive new eight inch ductile iron pipe, replacing the current six inch cast iron. A new six inch waterline connecting Harvard Avenue and five additional fire hydrants will all provide more water to the area, increasing pressure, flow and fire protection. This job will begin as soon as school lets out at Raytown South High School and is expected to be completed in approximately 60 days. Pardon our progress; please drive carefully in construction zones. Every attempt will be made to limit lane closures and detours. All projects are scheduled to last less than 90 days. The District will continue improving the water system for our customers, providing great tasting, safe water, now and for generations to come. The warm February weather has allowed Public Water Supply District No. 2 of Jackson County to start new water main replacement projects earlier than planned. 81st Street between Raytown Road and Ash Street. The District will be replacing a 4” cast iron main with 6” ductile iron pipe and will install two additional fire hydrants on 81st Street. The project should be completed in March of 2012. 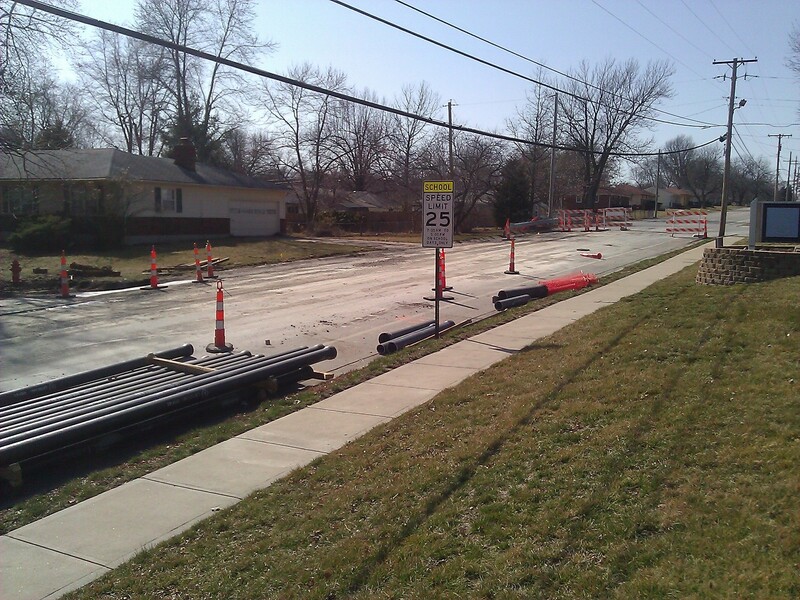 83rd Street will see a great deal of construction this Spring and Summer. Public Water Supply District No. 2 will be replacing a failing 8” cast iron water main, with ductile iron pipe between Spring Valley Road and Elm Street. This main will be going from the South side of the Street to the North, to make way for the City of Raytown’s sanitary sewer line replacement, which is scheduled to begin this Spring or Summer. Six additional fire hydrants will be installed in this section. The water main portion of this job should be completed by July of 2012. The board of directors of PWSD#2 has approved the following pipeline replacements. All new pipelines are ductile iron pipe and are replacing failing cast iron pipes of smaller diameters. 86th terrace from Booth to James A Reed, this project was to start in mid-July but now will start in mid–August and is estimated to last into October. The line will be located on the south side of the street. Willow Street from 66th street to 67th street and 66th street from Willow to Hardy, this project will start July 15th and take 5 weeks to complete. These construction projects will require lane closers from time to time, please drive carefully in construction areas.